Timber alternative Sliding Sash windows. Traditional appearance with modern engineered performance and security benefits. Composite doors are rapidly becoming the preferred choice of exterior door due to the security, aesthetical and durability benefits over traditional PVCu doors. Our Flush Sash windows and doors combine the elegance and style of traditional timber with all the benefits of PVCu. Thank you for visiting our website. PeakGlaze Ltd is a leading supplier of affordable PVCu windows, doors, timber alternative products, porches and conservatories in the Peak District and Derbyshire Dales. 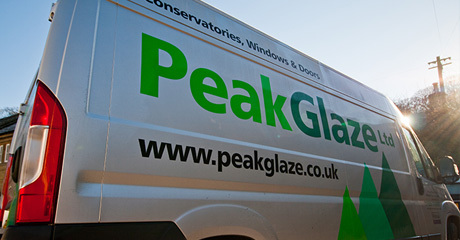 At PeakGlaze our aim is to provide an honest, trustworthy and professional service to our customers. Our family-run business based in Darley Dale, Derbyshire, provides high quality double glazing that is tailored to the needs of you and your home. The majority of our business is gained from recommendations and repeat business, therefore we guard our excellent reputation very closely. We are a local business and our team are all local residents who are passionate about the area and take pride in seeing quality installations that enhance the appearance of a property. Please take a look through our product galleries and check our Facebook feed for our latest installations. Alternatively, please visit our showroom at Darley Dale. PeakGlaze Ltd is also a registered Trusted Trader which means we are committed to promoting high standards and excellent customer care. For more information please click here.